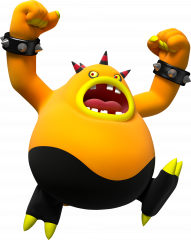 Zomom (ゾモン Zomon) is one of the primary antagonists of Sonic Lost World and a member of the Deadly Six. He is easily the largest of the Zeti, sporting a very obese orange body, red horns, stubby legs and a large mouth. Zomom's two dominant traits are his low intelligence and his boundless appetite. Simply put, Zomom is a glutton who will eat just about anything or even anyone, and simply mentioning food near him will drum up his appetite. As expected from a character of his size, Zomom isn't very bright nor is he very quick, possessing a very simple way of thinking, and can sometimes end up embarrassing himself. He also cannot understand figure of speeches, and can only tell Sonic and Tails apart by their color. He is very sensitive about his stupidity and size, getting hurt emotionally whenever somebody calls him "fat" or makes fun of his size. His idea of destruction involves inflicting physical punishment with his large size and devouring everything, and finds fun in hostile violence. An omnicidal monster, he has no qualms about causing massive genocide for his own gain. He also comes off as vengeful, as his idea of punishing Dr. Eggman for enslaving him is to squeeze him to death and eat him. As a hulking Zeti, Zomom possesses superhuman strength that's powerful enough to easily crush people to death and set off tremors. Despite his size, he's capable of spinning rapidly to the point of causing dust tornadoes, and can also burrow underground. Like all Zeti, Zomom has the ability to manipulate magnetic fields, allowing him to control electronics, which he does to Eggman's Badniks. 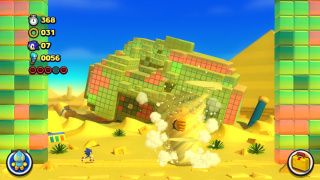 Under Eggman's orders, Zomom attacks Sonic at the end of Desert Ruins Zone 2, with the fight taking place atop a large totem-like face made of tiles. Zomom starts the battle by stomping the totem head to send it into freefall; making Sonic enter a skydive to catch up while avoiding giant spike balls that will hurt the hedgehog. Once Sonic catches up, Zomom will stomp the head to make it rotate. The player must run to the side it's rotating to, or they will fall to their death. From there, Zomom will then ambush the player with a belly flop that can be avoided by staying away from him as he falls. This will leave him dazed, making him vulnerable to a Homing Attack. 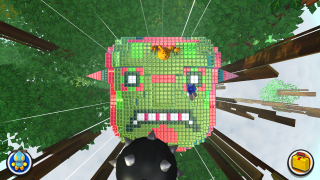 When enough damage is dealt, Zomom will repeat the process again, but this time his attempt to send the head into freefall will break away the tiles to reveal a smaller head with a much narrower surface. When he rotates the head, he will do it two to three times. When he's dazed, the player must keep hitting him until he goes down and retreats. This battle is repeated in Nightmare Zone, with the Totem Mech being replaced by one of Wizeman the Wicked's hands. 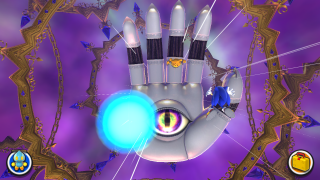 Sonic simply needs to land on the hand to end the fight. Zomom is fought a second time at the end of the second tornado chase in Desert Ruins Zone 4. After swallowing a whole stick of meat, the overweight Zeti will jump three times and attempt to slam the ground hard enough to set off a shockwave that will trip Sonic up if he is standing on the ground, so the player must jump to avoid this. This attack leaves him vulnerable for a few moments, so the player must strike with a Homing Attack quickly. The attack can be charged, but it is not recommended as Zomom will not stay idle for long. After hitting Zomom enough times, he will burrow underground to escape, and the player must then pursue him using the Yellow Drill. The player should not worry if he gets away, as a trail of rings will guide them in the right direction. At the end of the underground section will be an arena where the totem head from the previous battle will be lying there in a destroyed state, and Zomom will whip up a tornado that will stack tiles from the head on both sides of the screen. The player must not stand on either side of the screen, as the tiles can and WILL crush Sonic if he gets caught underneath them. For the third phase of the fight, Zomom will spin rapidly in circles to whip up a mini sand tornado that engulfs his body, then chase after the player. To avoid this attack, the player has to parkour up the tiles on either side of the screen and jump over Zomom. After a while, Zomom will get dizzy and become vulnerable to attack. After being attacked once, he will whip up a slightly taller sand tornado before getting dizzy again. A few more Homing Attacks at this point will finish him off. Zomom shows up after Zazz and before Master Zik in Lava Mountain Zone 1 to get his revenge on Sonic. 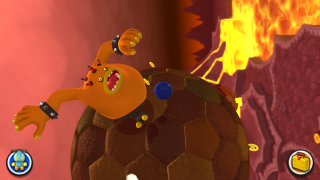 Upon landing on the planetoid via volcanic rock, the bloated Zeti will spin wildly and shoot fireballs in all directions, then he will burrow underground and pursue Sonic. If Sonic lures Zomom to the lava pit while he is burrowing underground, he will pop up and catch fire, making him vulnerable to attack. When hit enough times, Zomom will become more aggressive. Keep hitting him, and he will go down and disappear in a puff of smoke.  In the 3DS version, Zomom is encountered at the end of Desert Ruins where he will ride atop the giant totem head that stalked Sonic throughout Zone 3. During the battle, the totem head will bounce after the player and spit out fireballs that will home in on the player for a short while. The head and its attacks are easily avoidable by running away, though. To deal damage, the player must get behind the head and strike the crystal on its back using the Homing Attack. This won't be as easy, as there are totem blocks lying around that are also Homing Attack targets. When Zomom yells "You're the worst meal EVER! ", the totem head will rush at the player and fall down on its back, launching a volley of fireballs into the sky that will home in on the player. After doing this attack, Zomom and the totem head will be tired out, allowing the player to repeatedly attack the Zeti. Eventually, the totem head will be destroyed, leaving Zomom to fend for himself. He will then dash toward the player with his arms flailing out, but this attack is relatively easy to avoid. After whacking him with enough Homing Attacks, Zomom will be defeated. The player may also use the Indigo Asteroid Color Power to collect the tile blocks and deal significant damage to the totem head, and even knock out Zomom in one hit after the totem head is destroyed. This battle is repeated in Lava Mountain Zone 1, following the battle with Zazz. In this rematch, Zomom has more health and has a new attack when he is on his last hit point, where he will burrow underground and pursue Sonic. 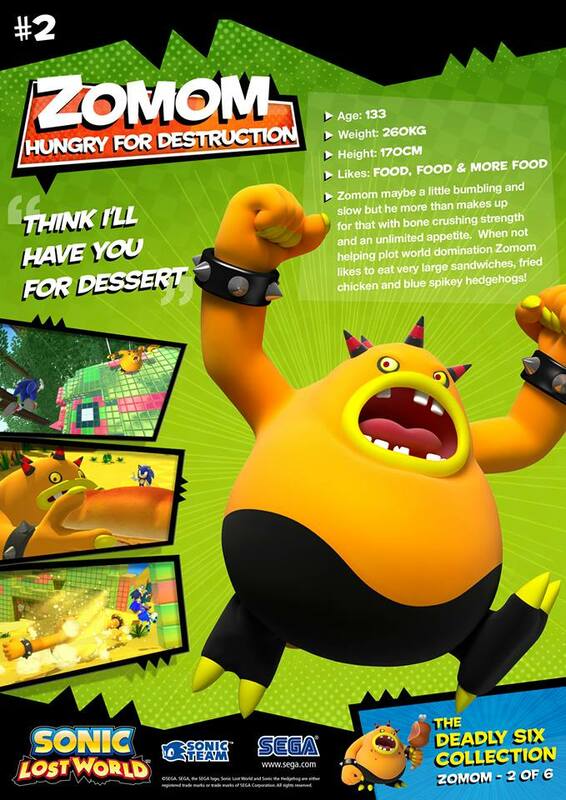 Zomom appeared during the storyline of the "Zazz Raid" event in Sonic Runners, where he tells Zazz that he hasn't got what it takes to defeat Sonic and suggests eating more food to boost his strength. Zazz takes this advice by munching on the Power Rings he's been gathering, giving the crazed Zeti an enormous power boost. This page was last edited on 3 November 2018, at 07:26.